Magnificent capture Jan, full saturated colours,awesome paterns, nice composition,. nice moments, well done jan. Very beautiful landscape with outstandingly lovely light! Perfectly exposed!!! Truly magical light!!! You've truly nailed it with this one! I don't think there's a comment worthy of this. Congrats!!!!!!! Awesome colours. Those reds are such a pearler. Well done. Beautiful scene...the lighting is terrific against the red mountain backdrop. Excellent work Jan. Excellent work,dude ;) beautiful saturated scenery, strong silhoutte looks nice. What an amazing magical light Jan! Excellent light you captured here !! Die Szene wirkt so unwirklich,magisch,wie aus einer anderen Welt,fantatsisch!!! thank you for bringing us light Jan. this picture is like your portfolio, very good. WOW ... magic light, indeed! SPECTACULAR shot; congrats! You could place it also in the "Decisive moment" project ;-) This is always my dream, to catch such an extraordinary moment, what a spectacular lighting situation ! Surely tweaked a bit in PS, doesn`t matter. The result is excellent ! Gorgeous light... this is the perfect exposure. Congrats on getting up so early (or staying out to watch the sun set) to capture this beautiful image. 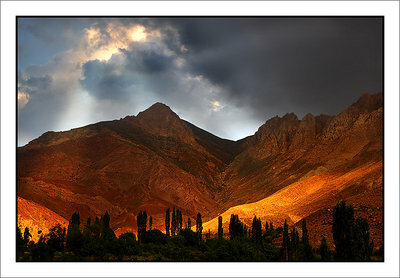 The entire image has magical light, from the interesting cloud shapes and light, to the varying shades of burnt orange in the mountain. that is great jan ,perfect at all. Gorgeous landscape Jan!What incredible mountains!The colors and light are fantastic!!! !The rays of light are awesome!!! STUNNING - such beauty Jan! A beautiful and powerful image. You could back the saturation off just a tad. Spectacular light, great view, moody and dramatic! Very nice! I guess you have been working around in PS with this. Good work. The golden light in combo with the powerful sky is a nice feature here. interesting colors and light. Nice capture.